Imphal, Aug 22 : Newspaper establishments in insurgency-afflicted Manipur resemble war offices, with heavily armed police guarding them. In addition to the State forces, the managements have engaged on a permanent basis private security men to guard the main gates and the offices. Editors and high profile journalists are avoiding public appearances and almost all of them have changed their mobile numbers clandestinely. They talk over telephone only when the caller’s identity is established. These precautions have become necessary since the death threat is palpable. 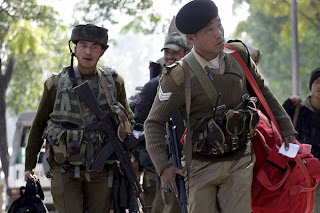 In Manipur, five editors and two other journalists were shot dead and many others survived bullet injuries; a few escaped assassination attempts. This State with a population of less than 27 lakh has 50 armed underground organisations and the number is increasing since new ones are formed or the existing ones are split into factions. A. Mobi, president of the All Manipur Working Journalists’ Union (AMWJU), who also edits a vernacular newspaper, Sanaleibak, says some outfits seek publicity using the local media for furtherance of their insurgency-related activities, especially extortions. The media faces all kinds of pressure from rival factions. One faction would ask the editors to publish a particular news, while another would not want it published. The punishment for noncompliance is indefinite closure of the newspapers or sometimes death of the editors. Having no alternative, newspaper offices had gone on strike for weeks together in the past. One Islamic militant outfit, the People’s United Liberation Front (P.M. Akber’s faction) threatened editors, journalists and newspaper distributors if its press releases were not published. Another faction of the Military Defence Force (MDF) was incensed when its press releases were not published. It named seven editors for execution for their refusal to publish the same. On August 11, Mr. Mobi’s house was attacked at night with Chinese hand grenades. There was no casualty. After a day’s strike and a procession by journalists, the police were galvanised into action. They rearrested Nando Thokchom, said to be the mastermind, from the maximum security prison at Sajiwa. There have been angry comments on the way an undertrial prisoner has been operating from inside the prison. In a scathing editorial, The Sangai Express deplored the nexus of politics and insurgency due to which the “criminal” Thokchom has been operating rather freely. Newspaper offices and houses of some editors are guarded by armed policemen. But this cannot be a permanent arrangement. Besides, scribes who return home after midnight are easy targets. Once the dust settles down, the armed policemen will be withdrawn. The Corcom, an apex body formed by seven underground organisations, has condemned the attacks and harassment of the scribes. In a statement, it said the presspersons should be given due respect in recognition of their services to society. But the problem is that many other outfits do not take orders from Corcom. Mr. Mobi has said the AMWJU will resist any attempt to arm-twist the media. Past experience has shown that it is a matter of time before the insurgents make their presence felt in the newspaper houses.